This is a brief account and tribute to the life of Laurie Lambert from the 1st of September 1929 to the 4th of February 2003. Laurie Lambert was born on the 1st September 1929 and was the younger of two sons. His parents were Cathy and Mervin Lambert and his elder brother was called John. Laurie was born and brought up in Leeds in the Hyde Park area and lived in a large town house on Moorland Road, close to the park. In addition to his parents and brother, his grandmother, affectionately called Bamba, also lived with the family. He also had memories of his great grandmother known as "Ma". An uncle (Elvin) and aunt lived in the house next door. Attending Belle Vue high school, where he first met his wife to be Norma Lancaster, Laurie had many memories of the second world war, but as a child these were as much exciting as they were terrifying. Not surprisingly he was interested in aircraft and enjoyed making models of them. He also had many of the old iron moulded soldiers and liked playing war games with them in his younger years. Laurie's childhood always sounded interesting and the family had numerous pets in the form of cats (one being Filis), rabbits and mice. The latter lived in hutches and cages in the garden and Laurie made a network of underground runs for them. As Laurie got older an interest in animals was replaced by one in motorbikes and he managed to own and damage several of them (including BSA's, Triumph's etc). He also broke both legs in accidents and was, by all accounts, a bit of a tearaway during this time. To add to his reputation, he even rode his bikes whilst still in a plaster cast. The interest in motorbikes also resulted in him becoming an apprentice mechanic (his father was also a mechanic) and I believe he worked at Jack Routh's garage during this (or part of this) period. Naturally he also did his 2 years National Service and was in the RAF. Laurie Lambert got married in 1955 and he and Norma initially lived in one of the upper rooms of his parent's house on Moorland Road before buying their own home in Cookridge. By this time Laurie had also left the motor trade and was now working in sales for a company called Office Supplies. After getting his sales feet with them (quite literally as he did an enormous amount of walking in this job), he moved to Acrow Engineers, a company specialising in formwork for the construction industry. At Acrow he also got his first company car, a novelty in the early 1960's, and became the regional representative and formwork design engineer for a large area running from south Yorkshire to Newcastle. He continued to work for Acrow (based in Leeds) until the mid 1980's when the company became insolvent. In 1960 Laurie and Norma had their first child, a son called Martin, and in 1965 he was followed by a daughter called Alison. Still living in Leeds, the family were probably more fortunate than most and with both Laurie and Norma working full time had two cars by the mid 1960's. Around the turn of 1970 the family also had their first foreign holiday, a Clarkson package holiday to Benidorm (in the days when Benidorm only had 4 or 5 hotels), with the flight on a then new Comet jet. The hotel was called the Monte Park. It was also in the early 1970's when Laurie was to discover a new interest, golf. This sport became a major passion and, although his handicap never reached the lows of some, he could be quite a bandit off 17 or 18 and played religiously in Saturday morning medals, what ever the weather. His long term fourball partner was Peter Fair, a great friend and excellent golfer and both were members of Horsforth golf club for many years. 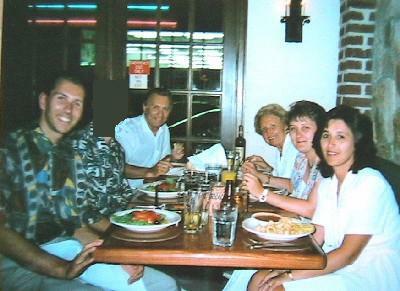 Family was always the most important thing to Laurie and birthdays, Christmas and holidays were always special events. As a gifted and self taught carpenter, Laurie made some amazing presents for his two children including a highly complex doll's house, a farm, a garage station and a medieval fort. The latter alone could have justified a small business based on the number of friends and visitors to the house who asked him if he would make something similar for their child. Other purchased presents also got the “Laurie treatment”. When he bought his son a Scalectrix, he made a six foot by 3 foot table for it with painted paper mashie mountains, underpasses, trees and buildings. Since most of the Lambert family's 1960's and 1970's holidays were before the real advent of affordable foreign package holidays, many vacations were to the UK's southern coast. Favourites were Devon and especially Woolacombe, with the then Naracott Grande Hotel being a favourite. A holiday there in 1966 also saw the England World Cup winning striker and hat trick scorer Geoff Hirst as a fellow guest and he even kicked a ball around with Laurie's small son Martin. An addition to the main family holidays, were regular stays in Laurie's parent's static caravan at Cayton Bay, Filey. These breaks usually took place during the school's summer holidays and saw Laurie and Norma drive to Filey in separate cars at the weekend. Laurie would then go to work on the Monday morning and Norma would stay for the week with the children and dog Whisky. Laurie would return on the Friday evening and they would have a second weekend in the caravan before heading back home. This was of course in the days when caravans had no electricity, used burning calor gas lights and water was collected from a stand pipe. Bathroom buildings contained toilet facilities and the biggest daddy longlegs in the world. Highlights of these caravan holidays were taking Whisky to the massive beach at Humamby Gap, playing “solo” on an evening, eating cakes from Sterchis and “crabbing” at Cayton bay. Throughout the 1960, 70's and 80's Laurie and Norma's best friends were Jim and Jean Thomas and they spent many Friday and Saturday evenings at the Post House in Bramhope, Leeds. At that time the Post House was the city's top hotel and was frequented by the city's visiting sports teams, film stars and pop stars. Both sets of parents often returned home, able to tell their children about a meeting with Pans People, the Australian cricket team or even David Bowie, the following morning. 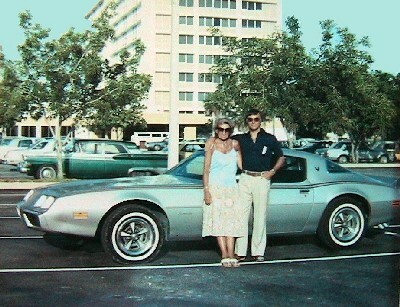 As the eighties dawned (1979), Laurie and Norma Lambert had their first holiday in the USA, visiting Florida on what would be the first of several occasions Their hire car was a Pontiac Firebird. The eighties also saw them become addicted to “cruising” and a Mediterranean or Caribbean cruise would become an annual event for the rest of their lives together. They also mixed in holidays to Europe and weekend breaks, both at home and abroad. In 1980, a new addition to the family was Siggy, Alison's cat who would live for the next 16 years. Life remained good for another decade, but in 1991 Laurie suffered a major heart attack. Whilst recovering from this, and awaiting a double bypass, more heart problems occurred when a valve in his heart burst resulting in emergency surgery. Despite cardiac arresting on several occasions, and with the skill of surgeon Mr Munch, heart care team headed by Dr Cowan (LGI) and his GP Dr Carter, Laurie made a long but reasonable recovery. His health would never be A1 again, but it was sufficient to allow a good quality of life to continue and he built up his strength over the next 12 months. Laurie's parents both in their late eighties, died in 1992 and 1993. Positives did surprisingly result from Laurie's heart problems, not least the restart of family holidays (this time to villas) with Norma and Laurie's son, daughter and respective partners having an annual vacation together each year. Laurie also got to see both his children married and gain three grandchildren after his illness. 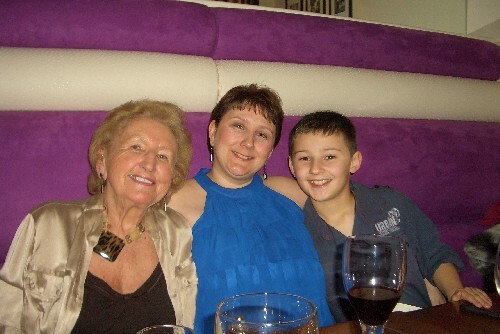 The family holidays now extended to three generations. Now fully retired and without a company car, Laurie also bought the first of what would be two BMW cars, something he had always wanted. He also added a cryptically personalised number plate. Enjoying better heath again, the cruises also continued and, with an accident at work resulting in Norma taking early retirement, both Lambert's were able to spend plenty of time together. Another hobby also started up. It was a combination of an interest in gardens birds and, not surprisingly, the making of feeders and bird boxes for them. The challenge, as any exponent of this pass time will know, is to make the feeders squirrel proof. The fact that there is no Lambert patent on such a device indicates Laurie's success in this venture. In 1999 Laurie was 70 years old and a hot and sunny late Autumn afternoon proved perfect for an outdoor party attended by many of his friends, old and new. At this time, and for the remaining 3 years of his life, Laurie seemed in good health and was actually more active than the typical 70 year old. The golf had largely gone after the heart problems, but country excursions more than took its place. Gardening, always a pastime, continued to be a leisurely pursuit and Laurie grew his annual crop of marigolds, pelegoniums, stocks etc in a greenhouse with great enthusiasm. 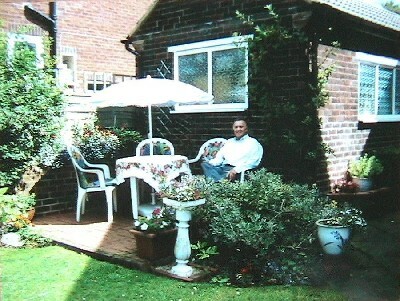 He also took every opportunity available to eat alfresco in the back garden on a small, but flower laden patio and invited the family around for regular bar-B-Q's. Life continued happily and uneventfully until late January 2003 when Laurie became suddenly unwell just days before a Caribbean cruise. He was admitted to hospital for some tests, but at that time with no great concern on the part of his GP or hospital staff. It did however become evident over the next couple of days that his health was failing quickly and he passed away in the early hours of Tuesday 4th February aged 73. His family were with him during his short time in hospital and the end was very peaceful. Laurie's funeral was held very quickly with only 36 hours of notification in the paper and no one but close friends, neighbours and family informed of his death. Despite this, his funeral was attended by a many people including work colleagues and friends, some from many decades earlier. David and Dan, the two sons of Norma and Laurie's great late friends Jim and Jean, were also present offering their support to the family. If you have looked at this page and wondered what the motivations behind it are, here is the explanation. Laurie Lambert was my father and, at the time of his funeral, neither I, nor my sister or mother felt capable of standing up and talking about him, something I regret very much. Since then I have attended 2 funerals and witnessed, on both occasions, a son of the deceased pay not just an emotional tribute to their father, but offer an interesting and sometimes humorous account of their life. Since I was unable to do this at the most appropriate time, this regrettably is my next best effort. The only other thing I can add, is to say that both my sister and myself have always had, and continue to have, the certain knowledge that neither of our parents could be improved upon in any way. We had a charmed childhood and our loss at our father's death continues to this day. Finally, if you find yourself in the position of contemplating talking about a loved one at a funeral or memorial service, but are concerned that you might breakdown in front of people, do not be. Go ahead anyway. If things do become overwhelming, and your emotions prevent you from saying what you intended to, or even if you breakdown completely, what more compelling tribute could you give.